ST GEORGE’S - Natural disasters present an opportunity for sustainable development, says Professor Mark Pelling of King’s College London. Delivering the 19th William G. Demas Memorial Lecture on May 29 in Grenada, the resilience expert argued that, although generally unwelcome, disasters provide focus and momentum to address previously existing development gaps. “Addressing disaster through risk reduction and post-disaster response surfaces unmet development failures that have lain, accumulating over time,” Pelling said. “I want to argue that wherever disaster management work is placed outside everyday development policy and practice there is a missed opportunity for sustainable development,” he added. The lecture took place ahead of the official opening of the annual meeting of the board of governors of the Caribbean Development Bank (CDB). Pelling, who spoke on the topic, “From Social Resilience to Survivor-Led Reconstruction” joined a distinguished roster of speakers who have delivered the lecture, which is part of the agenda of the CDB annual meeting. The speaker said that opportunities for addressing development challenges exist both in initial interventions that aim to reduce disaster risk, as well as in response and reconstruction after an event. He cautioned, however, that lessons from previous experiences should be heeded. “Too many response and reconstruction efforts [are] constrained by the interests and pressures of development and fall short of meeting their potential; too often reconstruction is incomplete with temporary shelter becoming permanent, inadequate, with relocation in particular seldom resulting in enhanced life chances. For the Caribbean Region, if the SDGs are to be achieved then truly response and reconstruction are an important element of this,” said the United Kingdom-based professor. • Working with communities and governments to better allow them to lead in response and reconstruction after disasters. 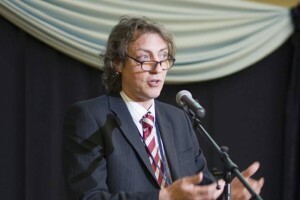 A highly regarded researcher, Pelling has worked in Latin America and the Caribbean, sub-Saharan Africa and Europe, and served as a consultant for the United Kingdom Department for International Development, United Nations agencies, the World Bank, and non-governmental organisations such as Greenpeace and Oxfam. He is the author of 80 peer-review papers and book chapters, and seven books, including Adaptation to Climate Change: From Resilience to Transformation and The Vulnerability of Cities: Social Resilience and Natural Disaster.